Colombo Both Indices declined compared to last week, with All Share Price Index (ASPI) and Milanka Price Index (MPI) falling 0.27% and 0.06% respectively. However, the market witnessed a higher average turnover compared to last week. 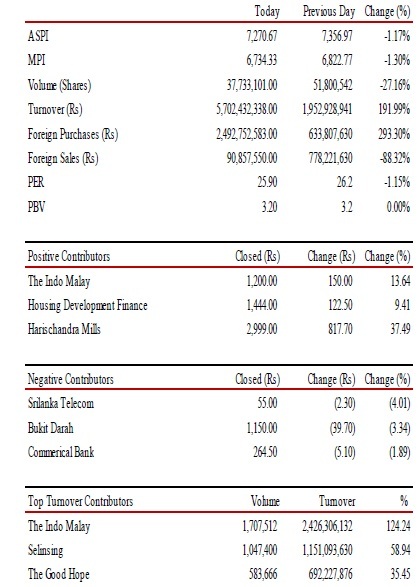 Market closed on a green note on Friday the 27 May 2011, mainly driven by retail and speculative investors. The All Share Price Index (ASPI) closed at 7,459.58 points, topped 0.54% by 40.14 points and the Milanka Price Index (MPI) rose 0.15% by 10.06 points to close at 6,875.54 points, during the day. 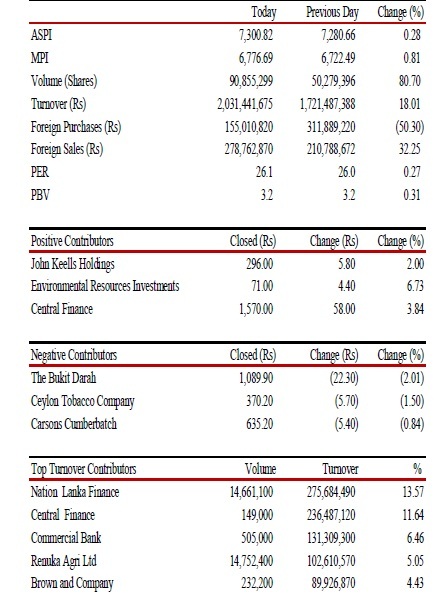 Total turnover was at Rs.2.37 billion (fell 34.18%) with a volume of 103.6 million shares changing hands (down 38.02%). Foreign purchases fell 26.68% to Rs.201.44 million and foreign sales dropped 36.94% to Rs.146.9 million. Price to forward Earnings Ratio (PER) rose 0.64% to 26.7 times. Highest gainer for the day was NDB Bank’s investment arm Capital Development and Investment Company PLC (CDIC) became the highest gainer at Colombo Bourse reaching over 49.98% previous day. The share price surged by Rs.134.70 to close at Rs.404.20 and a total of 26,500 shares changed hands during the market hours. Swarnamahal Financial Services (SFS), which was listed at Rs.11.40 and hit Rs.100 when it began trading Thursday but closed at Rs.45. Bank, Finance & Insurance sector was the main contributor to the market turnover due to Nation Lanka (CSF), while the sector index increased by 1.41%. Hotel and Travel sector also contributed significantly to the market turnover helped by Ruhunu Hotels (RHTL). 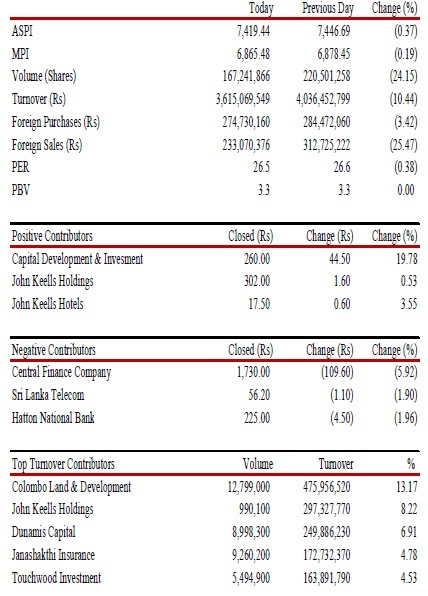 Nation Lanka Finance (CSF) was the main contributor to the market turnover. The share price increased by Rs 3.50 (14.60%) and closed at Rs.28.30. Colombo Stock Indices dropped amidst selling pressure witnessed in speculative stocks which saw rapid gains recently. Approach of the settlement dates could be the reason according to brokers. The decline in the more liquid Milanka Price Index (MPI) was controlled to a certain extent with the investor interest shown in some blue chip stocks. The All Share Price Index (ASPI) closed at 7,419.44, down 0.37 percent (27.25 points) while the more liquid Milanka index fell 0.19 percent (12.97 points) to close at 6,865.48 points. 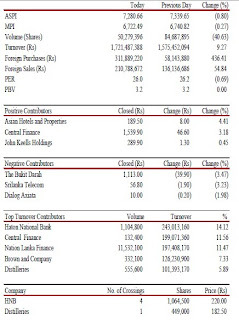 Turnover was at Rs.3.61 billion (fell 10.44%) with a volume of 167.24 million shared traded (down 24.15%) during the day. Foreign purchases fell 3.42% to rs.274.73 million and foreign sales also dropped 25.47% to Rs.233.07 million. Price to forward Earnings Ratio (PER) fell 0.38% to 26.5 times. Swarnamahal Financial Services (SFS), which began trading Thursday, closed at Rs.44 with 682,600 shares traded. The stock was listed at Rs.11.40 opened at Rs.100. Chilaw Finance (CFL), which also began trading Thursday, closed at 30.60 rupees, up 19.60 or 178 percent. The stock was listed at 11 rupees, opened at 30 rupees and hit a high of 60 rupees. The trades were in contrast to the listing of Senkadagala Finance (SFCL) which has not been traded since getting listed in March 2011. Several crossings were done including John Keells Holdings (JKH) 420,000 shares at Rs.300 per share, LB Finance (LFIN) 450,000 shares at Rs.193, Hatton National Bank Non Voting (HNB.X) 400,000 shares at Rs.130 per share and Seylan Bank (SEYB) 773,400 shares at Rs.7 4 per share. Bank, Finance & Insurance sector was the main contributor to the market turnover due to Janashakthi Insurance (JINS)), while the sector index decreased by 0.20%. 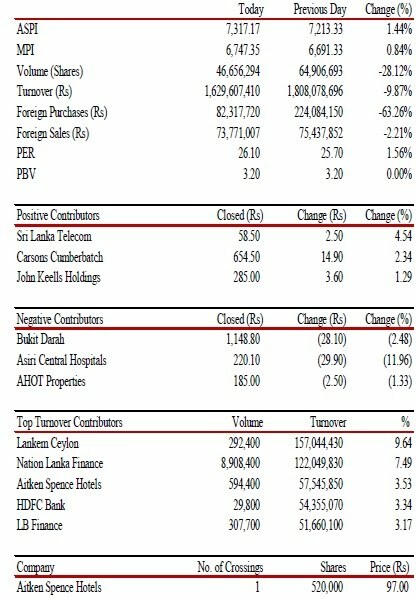 Land & Property sector also contributed to the market turnover due to Colombo Land (CLND), while the sector index decreased by 2.41%. 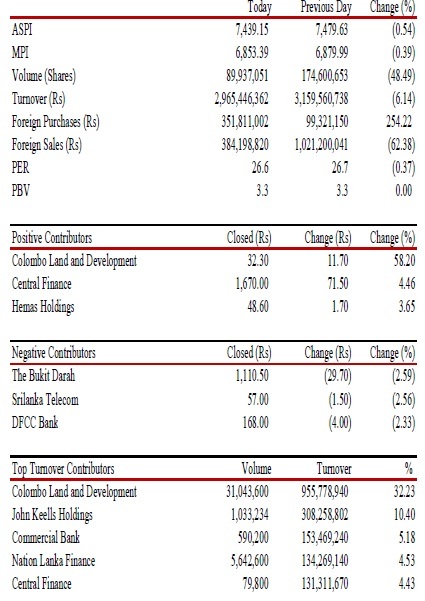 Colombo Land (CLND) was the main contributor to the market turnover. The company witnessed selling pressure after making rapid gains over the last couple of days. The share price decreased by Rs.3.26 (8.36%) and closed at Rs.34.50. Price appreciation of John Keells Holdings (JKH) helped MPI to outperform ASPI. Colombo’s Both stock indices edged slightly up towards the end of trading. The pending court case seems to have revived interest among the investors of Touchwood (TOUCH) while interest of speculative investors was seen on Colombo Land (CLND). The All Share Price Index (ASPI) closed at 7,446.69, topped 0.20% by 14.72 points and the Milanka Price Index appreciated 0.30% by 20.84 points to close at 6,878.45 during the day. 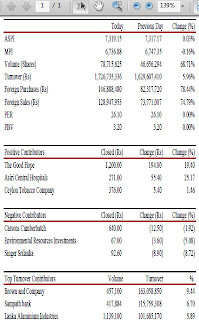 Turnover was Rs.4 billion (rose 59.93%) with a volume of 220.5 million shares changing hands (up 90.85%). Foreign purchases rose 134.86% to Rs.284.4 million and foreign sales also rose 19.44% to Rs.312.72 million. Price to forward Earnings Ratio (PER) remained steady at 26.6 times. Several crossings were recorded during the day including 4.05 million shares of Colombo Land (CLND) at Rs.38.30, John Keells Holdings (JKH) 495,900 shares at Rs.298 via two crossings and another 409,900 shares at Rs.301 with 579,400 Royal Ceramics shares at Rs.155 per share. market turnover and closed at Rs.38.30. Commercial Bank (COMB) announced a rights issue and a subdivision. Rights is to be issued on the basis of 1 for 7 shares at an issue price of Rs.181.65 per share (Voting) and Rs.130.13 per share (Non-voting). The Voting share closed at Rs.263.10 while the Non-voting share closed at Rs.191.50 today. Odel (ODEL) and Chemanex PLC (CHMX) announced final dividends of Rs 0.25 per share and Rs1.00 per share respectively while Kotagala Plantations proposed an interim dividend of Rs.5.00 per share. The Colombo Stock indices started to gain during early trading and dropped gradually to close on a mixed note. Milanka Price Index closed in green with the price appreciation of John Keells Holdings (JKH) & Hemas Holdings (HHL). All Share Price Index (ASPI) ended in red while Colombo Land (CLND) came under the price brand. The All Share Price Index (ASPI) closed at 7,431.97 points, dipped 0.10% by 7.18 points and the Milanka Price Index (MPI) topped 0.06% by 4.22 points to close at 6,857.61 points during the day. 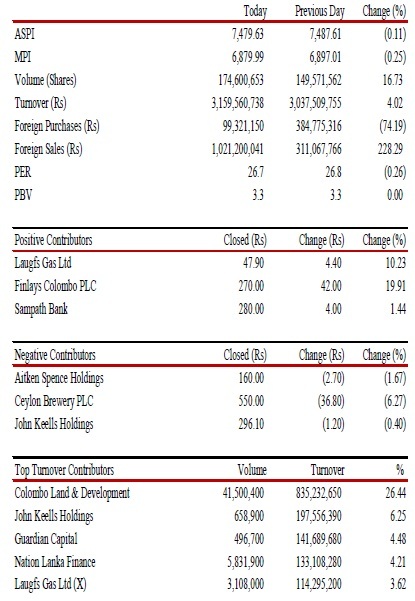 Total turnover was at Rs.2.52 billion (down 14.89%) with a volume of 115.53 million shares changing hands. Foreign purchases dipped 65.57% to Rs.121.12 million and foreign sales fell 31.85% to Rs.261.8 million. Price to forward Earnings Ratio (PER) dipped 0.11% to 26.57 times. 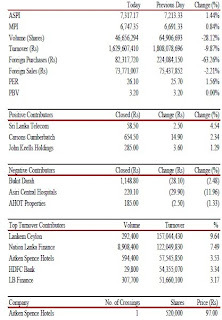 Several crossings were done including Aitken Spence Hotels (AHUN) 1 million shares at Rs.88.50, Ceylon Guardian (GUAR) 150,000 shares at Rs.150 and Asian Alliance (AAIC) 400,000 shares at Rs.130 per share via two crossings. 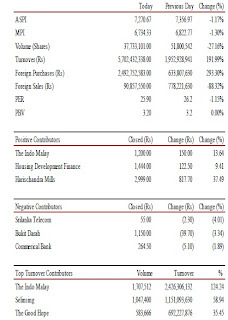 The Bank, Finance & Insurance sector was the main contributor to the market turnover due to Central Finance (CFIN) & Nation Lanka Finance (CSF), while the sector index decreased by 0.03%. The Land & Property sector also contributed significantly to the market turnover with the sector index gaining 4.04%. Colombo Land (CLND) continued to be the main contributor to the market turnover. The share price increased by Rs.3.10 (9.75%) and closed at Rs.34.90. 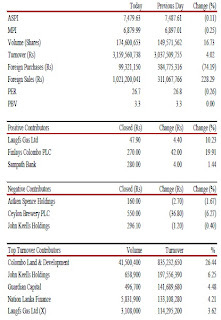 Central Finance (CFIN), Colombo Land (CFIN) and Nation Lanka Finance (CSF) continued to record rapid gains while price drops in illiquid stocks weighed on the ASPI mostly. Watawala Plantations announced a final dividend of Rs.0.85 per share. Land (CLND) amidst heavy retail investor participation drove the Land & Property sector, following the large transaction recorded last Friday. The All Share Price Index (ASPI) closed down 0.54% at 7439.15 points dipped 40.48 points and the Milanka Price Index (MPI) fell 0.39% by 26.60 points to close at 6,853.39 points according to stock exchange data. 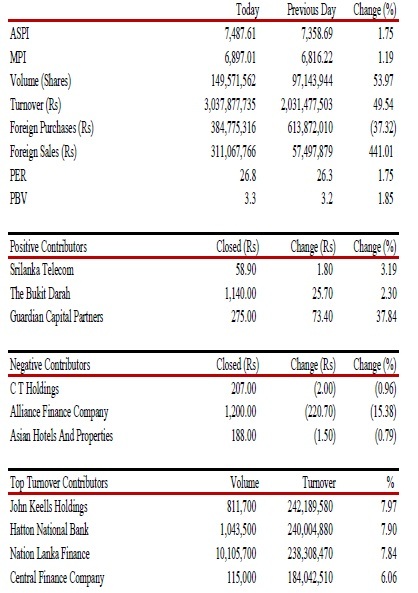 Turnover was Rs.2.9 billion (down 6.14%) with a Volume of 89.93 million shares changing hands (fell 48.49%). Foreign purchases rose 254.22% to Rs.351.8 million and foreign sales dipped 62.38% to Rs.384.19 million. Price to forward Earnings Ratio (PER) fell 0.37% to 26.6 times. John Keells Holdings (JKH) 545,534 million shares crossed at Rs.298 per share, Commerical Bank (COMB) 500,000 shares crossed at Rs.260 and Distilleries (DIST) 300,000 shares crossed at Rs.180 per share. The Land & property sector was the main contributor to the market turnover, while the sector index increased by 6%. Colombo Land (CLND) was the main contributor to the market turnover. The share price increased by Rs.11.70 (58.20%) and closed at Rs.32.30. 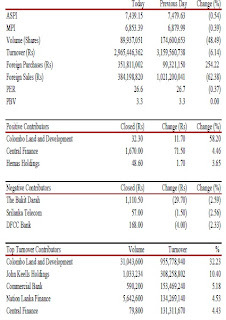 The Bank, Finance & Insurance sector also contributed significantly to the market turnover due to Commercial Bank (COMB) and Nation Lanka Finance (CSF) with the sector index dropping 0.37%. CIC Holdings (CIC) announced a final dividend of Rs.2 per share. The Colombo Stock indices ended in negative, paring gains earlier during the day, correcting the overreaction to extended deadlines on debt clearance. All Share Price Index (ASPI) and (MPI) gained 2.18% and 1.63% respectively for the week. The positive momentum may continue next week in view of the extension of debtor deadlines. The Land & property sector was the main contributor to the market turnover due to Colombo Land (CLND), while the sector index dropped 2.21%. Foreign holding in the company dropped by 40,233,533 shares. The All Share Price Index (ASPI) closed at 7,479.63 points, dipped 0.11% by 7.98 points and the Milanka Price Index (MPI) dropped 0.25% through 17.02 points to close at 6,879.99 points during the day. Turnover was Rs.3.16 billion (up 4.02%) and a volume of 174.6 million shares changed hands (up 16.73%). Foreign purchases fell 74.19% to Rs.99.32 million and foreign sales rose 228.29% to Rs.1.02 billion. Price forward Earnings Ratio (PER) dipped 0.26% to 26.7 times. Several other crossings were done including Central Finance (CFIN) 15,000 shares at Rs.1,600, Commercial Bank (COMB) 80,000 shares at Rs.260, Renuka Agri Foods (RAL) 3,644,800 shares at Rs. 6.80, HNB Non Voting (HNB.X) 200,000 shares at Rs.125 and Ceylon Guardian (GUAR) 65,000 shares at Rs.363 per share. 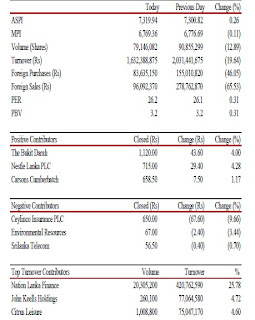 The Bank, Finance & Insurance sector also contributed significantly to the market turnover due to Ceylon Guardian (GUAR) and Nation Lanka (CSF) with the sector index climbing 0.02%. John Keells Holdings (JKH) proposed a final dividend of Rs.1.00 per share. The company also proposed to subdivide three (3) existing shares into four (4) new shares. The share dropped Rs. 1.20 (0.40%) to close at Rs. 296.10. CT Land Development (CTLD) also proposed a final dividend of Rs. 0.60 per share. 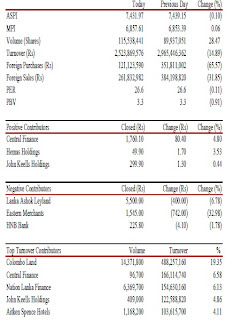 Colombo Stock Market recorded the second highest daily turnover for the month on Thursday 19 May 2011 after two years since Colombo Bourse started booming when Sri Lanka completely won its war against terrorism. Most shares gained as buying interest improved. While improvements in quarterly corporate earnings failed to improve prices since last week, the extended deadlines on debt collections for broking houses seem to have elated the investors. The All Share Price Index (ASPI) closed at 7,487.61 points, rose 1.75% by 128.92 points and the Milanka Price Index (MPI) topped 1.19% by 80.79 points closing at 6,897.01 points. 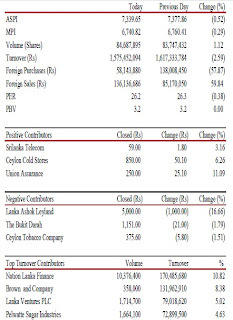 Total turnover was at Rs.3 billion rose 49.54% with a volume of 149.57 million shares changing hands (up 53.97%). Foreign purchases dropped 37.32% to Rs.384.77 million and foreign sales rose 441.01% to Rs.311.06 million. Price to forward Earnings Ratio rose by 1.755 to 26.8 times. The market watchdog Securities and Exchange Commission of Sri Lanka said it has extended a deadline to clear broker credit to the end of the year from an earlier June 30 date and thus brokers will have to clear 25% by Sept 30 and remaining credit and the balance in 31 December 2011. Several crossings were done including 1 million shares of HNB at Rs.230 per share via two crossings, 16.25 million shares of Asiri Hospitals (ASIRI) at Rs.8.50 through two crossings, 500,000 shares of Commercial Bank (COMB) at Rs.260 and 5 million shares of Dialog (DIAL) at Rs.10 with 60,000 shares of Ceylon Guardian (GUAR) at Rs.358 per share. 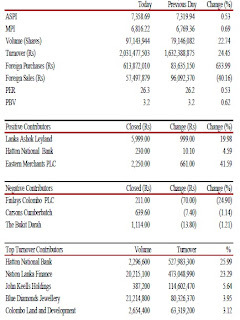 The Bank, Finance & Insurance sector was the main contributor to the market turnover driven by HNB Bank and Nation Lanka Finance (CSF), while the sector index increased 1.4%. Two crossings of 1,000,000 shares were recorded for HNB at Rs.230. Manufacturing sector also contributed significantly to the market turnover with the sector index climbing 2.99%. John Keells Holdings (JKH) was the top turnover contributor for the day. JKH price appreciated a further 0.98% and closed at Rs.299. Colombo Stock Indices improved supported by the price appreciations of HNB bank and John Keells Holdings (JKH) and the continuation of gains of some selected stocks. Positive interim results also seem to have spurred the momentum. The All Share Price Index (ASPI) closed at 7,358.69 points rose 0.53% by 38.75 points and the Milanka Price Index (MPI) up by 0.69% by 46.86 points to close at 6,816.22 points. 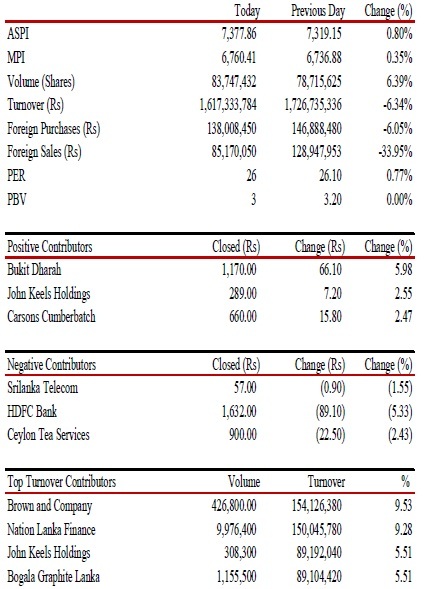 Turnover was at Rs.2 billion (up 24.45%) with a volume of 97.14 million shares changing hands (up 22.74%). Foreign purchases 633.99% to Rs.613.87 million and foreign sales dropped 40.16% to Rs.57.49 million shares. Price to forward Earnings Ratio (PER) rose 0.53% to 26.3 times. Alliance Finance (ALLI) was the top gainer of the day with its share up 552.3 rupees to 1435.30 while Finlays Colombo (JFIN) was the top loser, its share down 70 rupees to 211 .00. Housing Development and Finance (HDFC) Bank 29,900 shares crossed at Rs.1,550 per share. 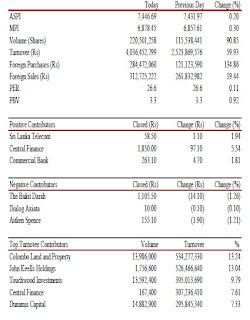 The Bank, Finance & Insurance sector was the main contributor to the market turnover mainly due to HNB bank and Nation Lanka Finance (CSF), while the sector index increased 1.37%. 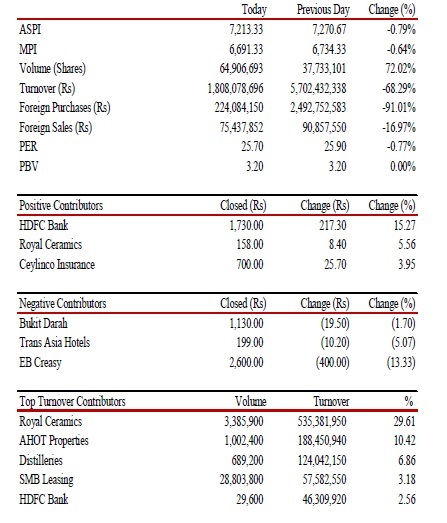 HNB bank was the main contributor to the market turnover. The share price increased by Rs.10.10 (4.59%) and closed at Rs.230. Foreign holding of the company increased by 2,275,300 shares. The Diversified sector also contributed to the market turnover due to John Keells Holdings (JKH). The sector index decreased 0.61%. Colombo All Share Price Index (ASPI) gained only 0.01% while Milanka Price Index (MPI) gained 0.48% for the week. Although there is still much speculation in the market, increased retail interest on certain fundamentally strong stocks, witnessed in the form of strong order books in such counters, indicate the possibility of a gradual market recovery. The All Share Price Index (ASPI) closed at 7,319.94 points rose 0.26% by 19.12 points and the Milanka Price Index (MPI) dipped 0.11% by 7.33 points to close at 6,769.36 points during the day. 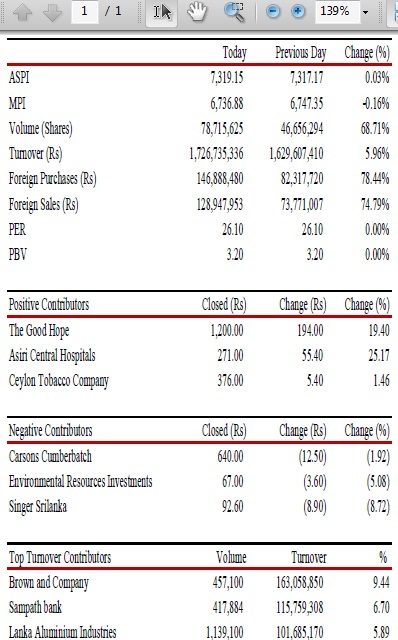 Total turnover was Rs.1.63 billion dipped 19.64% with a volume of 79.14 million shares changing hands (down 12.89%). Foreign purchases dropped 46.05% to Rs.83.63 million and foreign sales fell 65.53% to Rs.96 million. Price to forward Earnings Ratio (PER) rose 0.31% to 26.2 times. The Bank, Finance & Insurance sector was the main contributor to the market turnover mainly due to Nation Lanka (CSF) and Central Finance (CFIN), while the sector index decreased 0.12%. Nation Lanka (CSF) was the main contributor to the market turnover for the second consecutive day. The share price increased by Rs.2.50 (13.1%) and closed at Rs.21.60. The Hotels and Travels sector also contributed to the market turnover due to Citrus Leisure (REEF) and Marawila Resorts (MARA). The sector index increased 0.14%. Dipped Products proposed a final dividend of Rs 1.50 per share. Both Colombo Stock indices continued to stay green throughout the day while the Milanka Price Index (MPI) gained higher than the All Share Price Index (ASPI), helped by John Keells (JKH). Retail interest was witnessed with the price increase in a number of low value counters. All Share Price Index (ASPI) closed at 7,300.82 points, rose 0.28% by 20.16 points the Milanka Price Index (MPI) topped 0.81% by 54.20 points to close at 6,776.69 points during market hours. 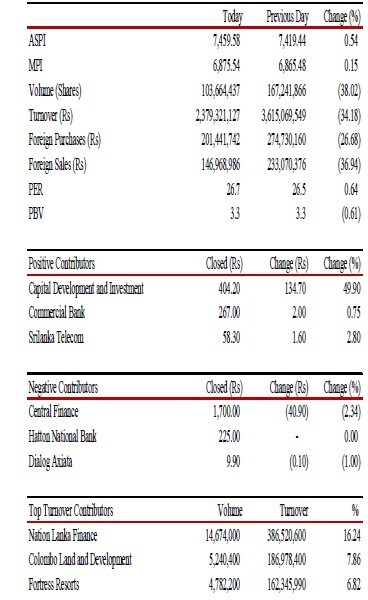 Total turnover was Rs.2 billion (increased 18.01%) with a volume of 90.85 million shares changing hands (up 80.7%). Foreign purchases dipped to Rs.155 million (down 50.3%) and foreign sales rose 32.25% to Rs.278.7 million. Price to forward Earnings Ratio (PER) increased 0.27% to 26.1 times. Commercial Bank (COMB) 500,000 shares crossed at Rs.260 and The Lion Brewery Ceylon PLC (LION) 100,000 shares crossed at Rs.235 per share. The Bank, Finance & Insurance sector was the main contributor to the market turnover mainly due to Nation Lanka (CSF), Central Finance (CFIN) and Commercial Bank (COMB), while the sector index increased 0.64%. 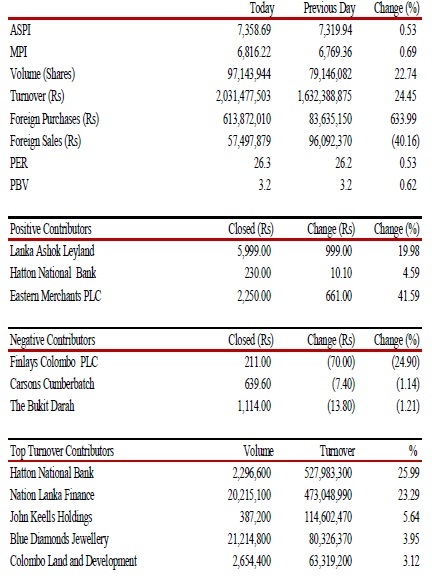 Nation Lanka (CSF) was the main contributor to the market turnover. The share price increased by Rs.1.60 (9.14%) and closed at Rs.19.30. Following the announcement of a proposed subdivision which will be issued on the basis of 2 shares for 1 share held, Tea Smallholder Factories (TSML) share price increased by 14.86%. In addition, John Keells Ltd. (JKL) proposed a subdivision of two (2) for every one (1) share held. C W Mackie (CWM) proposed an interim dividend of Rs.1 per share. Both Colombo Stock indices continued to drop for the third consecutive day. The Milanka Price Index (MPI) managed to turn green as the day progressed, but did not sustain the increase. Turnover levels and volumes continued to remain unimpressive. Colombo’s All Share Price Index (ASPI) closed at 7,280.66 points, fell 0.80% by 58.99 points and the Milanka Price Index (MPI) dipped 0.27% 18.33 points to close at 6,722.49 points. 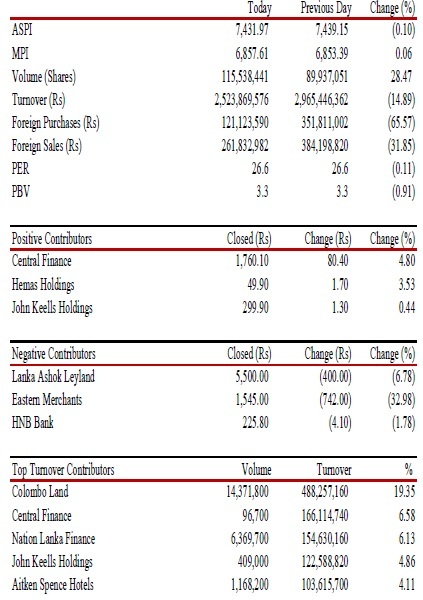 Total Turnover was Rs.1.72 billion (up 9.27%) with a total volume of 50.2 million shares changing hands (dipped 40.63%). Foreign purchases rose 436.41% to Rs.311.88 million and foreign sales rose 54.84% to Rs.210.7 million shares. Price to forward Earnings Ratio (PER) decreased 0.69% to 26 times. HNB 1 million shares crossed at Rs.220 per share and Distilleries (DIST) 449,000 shares crossed at Rs.182.50 per share. 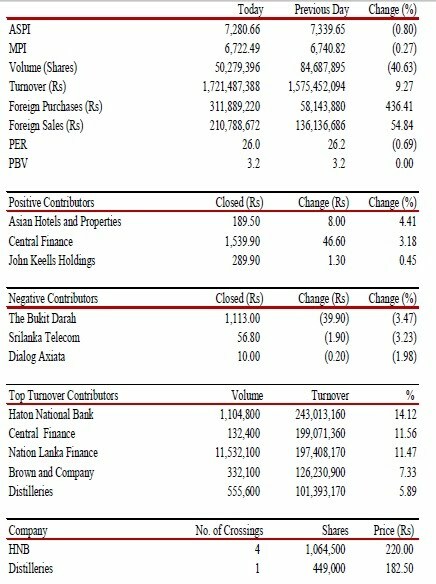 The Bank, Finance & Insurance sector was the main contributor to the market turnover mainly due to HNB, Central Finance (CFIN) and Nation Lanka Finance (CSF), while the sector index dropped 0.42%. per share. HNB revised its proposed rights issue to one (1) for five (5) shares from (1) for (6) shares announced earlier. In addition, Asian Hotels and Properties (AHPL) and Trans Asia (TRAN) proposed a subdivision of two (2) for every one (1) share held. Colombo Stock Indices closed in red after gaining during early trading, as prices depreciated in illiquid stocks. However, a reaction for positive earnings results was witnessed to a certain extent. Sri Lanka’s All Share Price Index (ASPI) closed at 7,339.65 points, dipped 0.52% by 38,21 points and the Milanka Price Index (MPI) dropped 0.29% by 19.59 points closing at 6,740.82 points during the day. Total turnover was Rs.1.57 billion dipped 2.59% with a volume of 84.6 million shares changing hands (up 1.12%). Foreign purchases dropped 57.87% to Rs.58.14 million and foreign sales increased by 59.84% to Rs.136.13 million. Price to forward Earnings Ratio (PER) dipped 0.38% to 26.2 times. 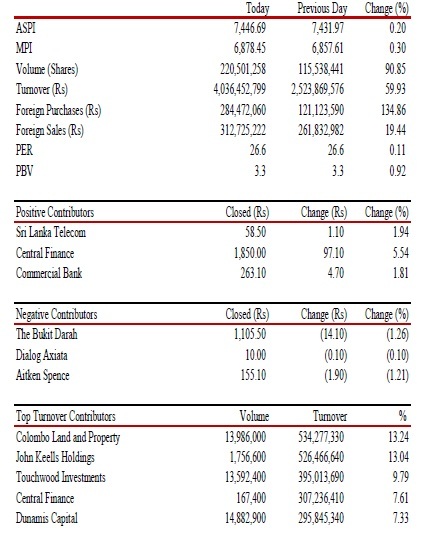 The Bank, Finance & Insurance sector was the main contributor to the market turnover mainly due to Nation Lanka Finance (CSF) and Lanka Ventures (LVEN) with the sector index decreasing 0.37%. Nation Lanka Finance (CSF) was the main contributor to the market turnover. The share price increased by Rs.0.70 (4.46%) and closed at Rs.16.40. The Manufacturing sector also contributed to the market turnover mainly due to Pelawatte Sugar (SUGA) with sector index decreasing 0.26%. The share price of Ceylon Cold Stores (CCS) increased by Rs.50.10 (6.30%) amidst an announcement of a proposed sub-division and a rights issue. The rights are to be issued on the basis of one (1) for every ten (10) shares at Rs.300 per share, followed by a subdivision of four (4) for every one (1) share. Union Assurance (UAL) also announced a sub-division of one (1) for every two (2) shares. The share price increased by Rs.25.10 (11.09%). Lion Brewery (LION) announced an interim dividend of Rs.4 per share. Colombo Stock Indices remained in green amidst investors reacting well to positive interim results. The bullish momentum witnessed towards the end of the last week may continue this week as well. Renewed interest was witnessed in some blue chip stocks also. However, low turnover levels remain a concern. The All Share Price Index closed at 7,377.86 points, rose 0.8% by 58.71 points and Milanka Price Index (MPI) topped 0.35% by 23.53 points to close at 6,760.41 points, during the day. Total turnover was Rs.1.61 billion (dipped 6.05%) with a volume of 83.74 million shares changing hands up 6.39%. Foreign Purchases dropped 6.05% Rs.138 million, foreign sales dipped 33.95% to Rs.85.17 million. Price to forward Earnings Ratio (PER) decreased 0.77% to 26 times. 1.07 million shares of Hemas Holdings crossed at Rs.47 per share. The Bank, Finance & Insurance sector was the main contributor to the market turnover mainly due to Nation Lanka Finance (CSF) with the sector index decreasing 0.31%. 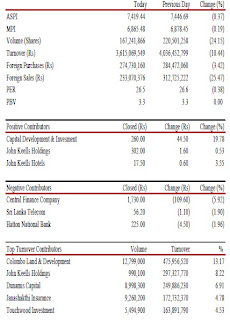 Nation Lanka Finance (CSF) has gained 63% since March end. Brown and Co. (BRWN) was the main contributor to the market turnover. The share price increased by Rs 3.10 (1.25%) and closed at Rs.363.50. Brown & Co. (BRWN) has gained 44% since mid-March. The Manufacturing sector also contributed to the market turnover sector index increasing 0.74% mainly due to Bogala Graphite (BOGA). The share price increased by Rs.22.80 (up 38.30%). Merchant Bank of Sri Lanka (MBSL) announced a final dividend of Rs.1.25 per share. Colombo All Share Price Index (ASPI) and Milanka Price Index (MPI) declined 0.51% and 1.26% respectively during the week ended. Positive momentum seen over the last 2 days of the week till Thursday lost steam on Friday the 6 May 2011. The All Share Price Index (ASPI) closed at 7,319.15 points, rose 0.03% by 1.98 points and the Milanka Price Index (MPI) fell 0.16% by 10.47 points to close at 6,736.88 points. Total turnover was Rs.1.72 billion (increased 5.96%) and a total volume of 78.7 million (rose 68.71%) shares changed hands. Foreign purchases rose Rs.146.8 million (topped 78.44%) and foreign sales Rs.128.94 million (rose 74.79%). Price to forward Earnings Ratio (PER) remained at 26.1 times. Several crossings were done including Sampath Bank (SAMP) 402,484 shares at Rs.277, Ceylon Guardian Investment (GUAR) 100,000 at Rs.380 and John Keels Holdings (JKH) 100,000 shares at Rs.280. Positive earnings results may boost indices next week according to brokers. The Bank, Finance & Insurance sector was the main contributor to the market turnover mainly due to Sampath Bank (SAMP) and Central Finance (CFIN) with the sector index increasing 0.06%. Brown and Co. (BRWN) was the main contributor to the market turnover. The share price increased by Rs.9.30 (2.67%) and closed at Rs.357.10. The Manufacturing sector also contributed to the market turnover sector index increasing 0.35%. Hatton National Bank (HNB) announced a rights issue of 1 for every 6 shares held. The Voting and Non Voting rights will be priced at Rs.219.50 and Rs.119.50 respectively. Colombo Stock Prices rebounded with almost all sector indices recording gains. A recovery was expected after the negative momentum witnessed during last few days according to brokers. Institutional investor participation was witnessed today to a certain extent and the interest may have to continue to sustain prices. The All Share Price Index (ASPI) closed at 7,317.17 points, topped 1.44% by 103.84 points and the Milanka Price Index (MPI) increased 0.84% by 56.02 points closing at 6,747.35 points. Total turnover was at Rs.1.62 billion (fell 9.87%) with a volume of 46.6 million shares changing hands (down 0.84%). Foreign purchases dipped 63.26% to Rs.82.3 million and foreign sales fell 2.21% to rs.73.7 million. Price to forward Earnings Ratio (PER) rose 1.56% to 26.1 times. Several crossings were done including Aitken Spence Hotels (AHUN) 520,000 shares at Rs.97, LB Finance (LFIN) 250,000 shares at Rs.168, Ceylon Tobacco (CTC) 60,000 shares at Rs.380, Tokyo Cement Non-Voting (TKYO), (TKYO.X) 750,000 shares at Rs.44, John Keells Holdings (JKH) 84,500 shares at Rs.280 per share. 1.35%.Lankem Ceylon (LCEY) was the main contributor to the market turnover. The share price increased by Rs.50.90 (10.15%) and closed at Rs.550.90. The Manufacturing sector also contributed to the market turnover with sector index increasing 1.13%. DFCC Bank announced a final dividend of Rs.3 per share. The share price of the company moved up by Rs.4.90 (1.12%) and closed at Rs.171.80. Piramal Glass (GLAS) also announced a first & final dividend of Rs.0.30 per share. Colombo Stock Indices dipped further continuing the selling momentum. However, Royal Ceramics (RCL) and AHOT Properties (AHPL) attracted investors despite the negative sentiment. Foreigners turned out to be net buyers during the day. Colombo's All Share Price Index (ASPI) closed at 7,213.33 points falling by 57.4 points (fell 0.79%) and the Milanka Price Index (MPI) of more liquid stocks closed 43 point down (fell 0.64%) at 6,691.33 points. Total of 64.9 million shares changed hands (up 72.02%) reporting a Rs.1.8 billion turnover (fell 68.29%). Foreign purchases fell 91.01% to Rs.224.08 million and foreign sales dropped 16.97% to Rs.75.4 million. Price to forward Earnings Ratio (PER) fell 0.77% to 25.7 times. Another crossing of AHOT Properties (AHPL) was witnessed with 1 million shares at Rs.188 per share. The Manufacturing sector was the main contributor to the market turnover mainly due to Royal Ceramics (RCL) with the sector index increasing 0.30%. Royal Ceramics (RCL) was the main contributor to the market turnover with a crossing 1 million shares at Rs.165. The share price increased by Rs.8.40 (5.56%) and closed at Rs.158. 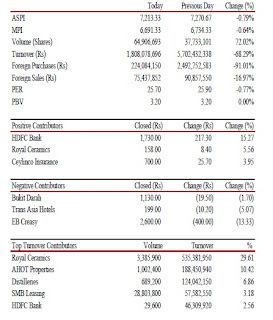 The Bank, Finance & Insurance sector also contributed to the market turnover; sector index decreasing 0.63%) due to SMB Leasing (SEMB) and HDFC Bank (HDFC) with speculation about share splits. Foreign holding of Distilleries (DIST) increased by 640,000 shares. However, the share price decreased by Rs.0.70 (0.39%) and closed at Rs.180. Colombo Stock Indices closed red amid low trade volumes while the turnover received a boost from oil palm sector transactions. The new direction issued on the limits of margin trading would also have contributed to the lackluster performance. The All Share Price Index (ASPI) closed at 7,270.67 points, dipped 1.17% by 86.30 points and the Milanka Price Index (MPI) dropped 1.30% by 88.44 points closing at 6,734.33 points during the day. 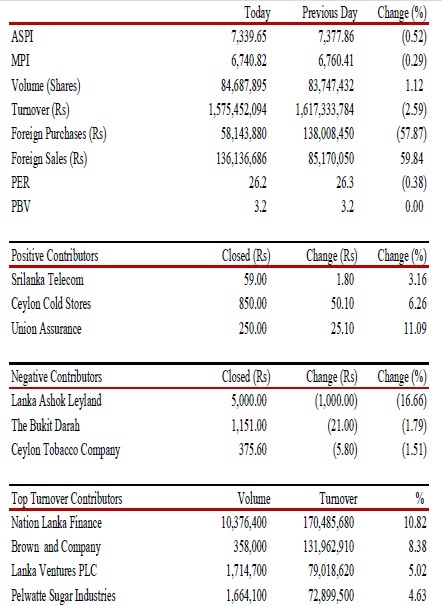 Turnover was at Rs.5.7 billion (rose 191.99%) with a volume of 37.7 million shares changing hands (fell 27.16%). Foreign purchases rose 293.3% to Rs.2.4 billion and foreign sales dropped 88.32% to Rs.90.8 million. Meanwhile Price to forward Earnings Ratio dipped 1.15% to 25.9 times. 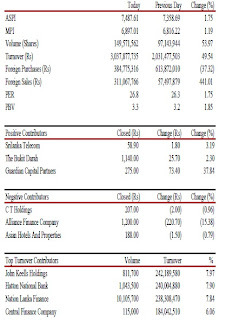 The oil palm sector was the main contributor to the market turnover mainly due to The Indo Malay PLC (INDO) and Selinsing Company (SELI) with the sector index decreasing 2.07%. The Indo Malay PLC (INDO) was the main contributor to the market turnover with four crossings (1,707,112 shares at Rs.1,421). The share price increased by Rs.150 (13.64%) and closed at Rs.1,200. The Bank, Finance & Insurance sector also contributed to the market turnover sector index decreasing 1.23%. Nuwara Eliya Hotels (NEH) announced an interim dividend of Rs.5 per share. Trans Asia Hotels (TRAN) also declared a first and final dividend of Rs.3 per share.